Once upon a time, I have been there. And “why not?”, you say– Aren’t antacids supposed to aid in digestion? Growing up, and even into college, I loved those things. I would look for any excuse to pop a few. Why not? Some of those things taste like candy! And truthfully, some of them very well may be. In order to avoid indigestion and tummy aches in the first place, it would be wise to cut out products like dairy, soy and peanut butter. All of which are difficult for the body to digest, in the first place. Your second step would be to practice proper food combinations. You can read more about food combining here. In short, what food combining pairs foods that require the same digestive acids, and enzymes. These acids and enzymes work together to break down the food, instead of against it. If you practice proper food combining, and eliminate certain foods from your diet, indigestion will be a way of the past. But why not tasty Antacids? 1. Antacids, especially ones that contain aluminum, can interfere with calcium, zinc, and magnesium absorption, and function. It is not uncommon for the elderly to over consume antacids due to frequent and reoccurring indigestion, and heartburn, and thus encourage mineral deficiencies. Hello, osteoporosis? 2. Antacids containing aluminum hydroxide, or calcium carbonate can weaken protein digestion, and lead to constipation. 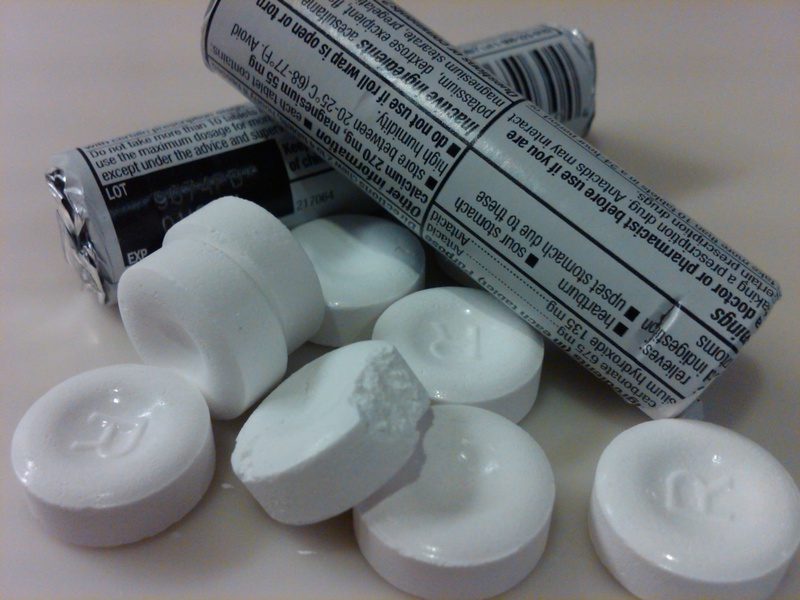 While antacids containing magnesium hydroxide, or sodium bicarbonate, may cause diarrhea (1). Sounds a bit counterintuitive, hmm? 3. Although popular brands of antacids do not contain aluminum, they may contain dairy, sugar, or other sweeteners, and animal products. They may contain also traces of lead. The chewy antacids, even contain hydrogenated oils– as in trans fats! That is just asking for indigestion. That would be like swallowing gum, whole. 4. Additionally, many calcium supplements, and antacids, obtain their source of calcium from the limestone rock. This is a larger topic in itself, but it does not seem wise to me that we ingest fragments of rock. It is not an uncommon belief amongst naturopaths, and doctors alike, that calcium supplementation, can aid in the degenerative process in the blood, organs, and tissues. (I do not feel that this applies to plant-based calcium supplements). In other words, don’t eat rocks, they may deteriorate the body. -Avoid hard to digest foods, like dairy, soy, peanut butter, and processed and refined goodies. -If you are really concerned with your inability to digest, try a digestive enzyme. I am personally a fan of Healthforce Nutritionals, products. (1) The Four Main Active Ingredients in Antacids to Look out for, by Edward V.